In the past two decades, college tuition at universities has doubled. Robert Morris University just announced a tuition adjustment too, but in the opposite direction — starting in 2019, RMU will match Pitt and Penn State’s in-state tuition for Pennsylvania residents also admitted to those schools, a scholarship of over $15,000 per year. 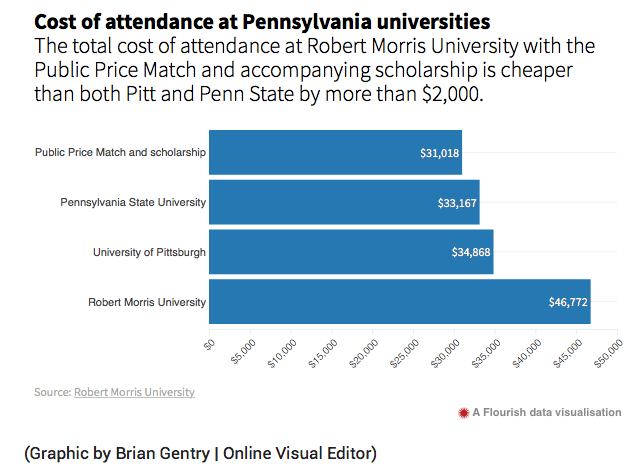 This “Public Price Match Plus” guarantee may be revolutionary for a small, private college, but it’ll only end up affecting around 20 students per year — so it’s not nearly enough to ensure affordable education for all Pennsylvania residents. Pennsylvania state schools are in dire need of a tuition reduction — but until that happens, private universities should match the tuition rates of their public counterparts for all in-state students. Other parts of the United States have already evened out tuition across public universities. The Western Undergraduate Exchange program enables out-of-state students across 16 different states — including California, Arizona and Oregon — to enroll in more than 150 public institutions at 150 percent or less of that college’s in-state tuition. Because students on the West Coast have more colleges to choose from, universities need to lower their tuition to attract the most talented candidates — colleges in the West Coast cost one-third the price of Pennsylvania’s public schools. Since many students eventually settle in the same area where they went to college, keeping talented students in Pennsylvania is important to ensure a flourishing job market. Exorbitant college tuition rates only push students out of the state — so it’s no coincidence that Pittsburgh is the 10th worst metropolitan area at keeping college graduates, with a retention rate of 50 percent. New York State provides free tuition to any resident who makes less than $125,000 per year — in exchange, students must work in the state for four years after graduation. And New York City, unlike Pittsburgh, ranks third in the country for retaining college graduates at 74 percent. “If New York can do it, I can’t see why Pennsylvania can’t,” said Ben McCoy, a cash-strapped junior at Westmoreland County Community College in Pennsylvania. Pennsylvania should adopt similar programs to New York and the West Coast to make college more accessible and retain graduates. But most Pennsylvanians attend private universities, so reducing tuition at those institutions could make an even greater impact. Most private colleges — not just the highly elite ones — have the finances to do this, too. Rosemont College, a small middle-of-the-road Catholic school outside Philadelphia, almost halved its tuition price in 2016. “For us and for our families, the system that most colleges and universities are following of having very high sticker prices and high discounts to go along with it was really getting out of hand,” said Rosemont President Sharon Hirsch. In response to the price cut, Rosemont saw its applications soar 64 percent — so if RMU wants to improve its enrollment numbers, it should cut tuition unilaterally, not just for 20 students. Likewise, if Pennsylvania wants a thriving job market and a debt-free population, it should emulate the West Coast’s model — no longer should the state someone grows up in prevent them from going to college.